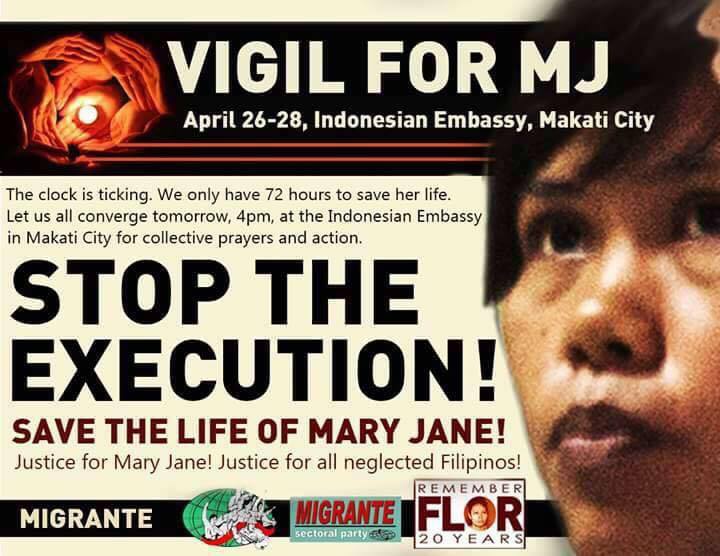 Last night, at around 6:00pm Philippine time, Mary Jane’s parents and Filipino lawyers who are in Cilacap port in Indonesia confirmed to Migrante International that Mary Jane had been served the notice of the date of execution. In this light, supporters of the #SaveMaryJaneVeloso campaign are calling on Pres. Benigno Aquino III to do everything he has to do to stop the execution. “The clock is ticking. We have 72 hours to save Mary Jane’s life. The Filipino people are behind Mary Jane and her family. We are not giving up,” said Garry Martinez, Migrante International chairperson. Speak up and speak publicly. Prove to the Filipino people and the world that he is opposed to the execution because Mary Jane is innocent and does not deserve to die. Since Mary Jane’s case has been brought to worldwide attention, Aquino has yet to speak up. His silence brings a message to the Filipino people that he is not against the sentence. “Silence means yes. Kailangang magsalita ni Aquino sa harap ng buong mundo at ideklara ang kanyang protesta. Hindi pwedeng kung sinu-sinong alipores niya ang pinapaharap niya. Tulad sa Mamasapano, he has ‘command responsibility’ over Mary Jane’s fate,” said Martinez. Pull out the Philippine embassy in Jakarta in protest. Brazil and Holland recalled their ambassadors in Jakarta when the Indonesian government executed six prisoners last January. The Australian government had also already retracted foreign aid to Indonesia. Suspend approval of new applications of Indonesian investments in the Philippines. This is to show Indonesia that going ahead with the execution would strain not only diplomatic but economic relations. Direct the Department of Foreign Affairs (DFA) publicly release all of the names of Filipinos in jails and on death row abroad and the names of their embassy-appointed lawyers. Presently, there are 41 other Mary Janes on death row abroad, according to the DFA – one Filipino in Saudi Arabia, 18 in Malaysia, 19 in China and two in Vietnam. “The government has to be transparent in what it is doing to assist and save the lives of all Filipinos on death row,” Martinez said. The #SaveMaryJaneVeloso campaign will start holding vigil at the Indonesian embassy at 4:00pm today. Masses and prayers are also being offered in different churches around Metro Manila and in the regions today for the call to stop Mary Jane’s execution.